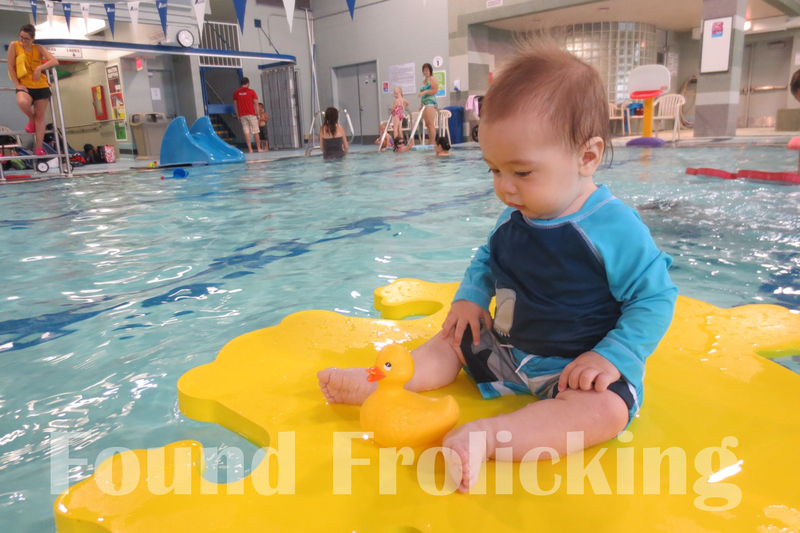 At the City of Edmonton Confederation Recreation Centre, swimming in the salt water pool! 46 weeks. He is so cute! I just want to squeeze him :) Wish you guys lived close! Well, isn't that the neatest thing I have ever seen for the pool. Oh and the yellow frog thing is pretty handy looking also! Awww that's adorable! Looks totally comfortable just hanging out on that cool floaty thing haha. The picture quality looks great too, what kind of camera do you use? Patricia, I have two cameras, and this is the more inexpensive of the two. It is the Canon Elph 320, which cost me about $160! It's 18 MP. It tends to do well it dimmer lighting, this would have turned out blurry with my other camera (a Canon Rebel XSi)! It's not great for zooming (gets very blurry and grainy), and I'm also not crazy about the video function since the sound isn't great. But, it is just a camera meant to be a point and shoot, which it does very well. I highly recommend it for being a camera you keep in your purse for those impulsive moments where you want photos. He looks so cute and serene, enjoying the water. And his duckie! My grand daughter, age 4, is afraid of the water and will only dangle her feet in. I've never seen a "floatie-thing" like in the photo. That would be perfect for her, I think. Must be a Canadian thing! Yabbly Gift Card Giveaway Blogger Opp! Announcement: Winner of Head-Lites Giveaway! It's Official! Baby E is Going Mobile!